Also, reading Ravi Subramanian for the first time ever, yeah shoot me. I, unfortunately, call a spade exactly that. I hate nick names! I hate books over 250 pages, there I said it!!!! If you are humming Gangster’s paradise, you really need to focus…. A CIA agent somewhere in Angola shuttles between a dangerous arms deal and blood diamonds, albeit not for the first time. Closer home in Kerala, a solitary, elderly man takes on the government on the supposed nuclear plant to be commissioned, unaware of the consequences. While at The Greater Boston Global Bank (GB2) in Mumbai, games are played, tables are turned, new leaders emerge and quantity is the new quality. Someone rightly said, happy balance sheets don’t ask any questions, until death comes knocking for some answers. However, unearthing secrets can prove to be fatal, especially when reputation and regulations are at stake. Will GB2 survive this catastrophe and rise like the Phoenix? Or does it succumb to its injuries and die an immature death? Also parallel lines never meet, so are these stories connected after all? Is the Bankster a person, a plot or a code name? For that you will need to read the book! Ravi Subramanian is a good story teller. His grip on his domain is clearly visible and he breezes through the book taking the reader along with him. The easy going narrative keeps the story at a steady pace. Loved that about the book where a chapter did not stretch from now to kingdom come. Yes, there are times when you really want to be in Mumbai but are taken to Kerala or elsewhere. Bottom-line, he does manage to push you just a wee bit off your seat in anticipation of ‘what next?’ The interaction between the employees of GB2 brings to the fore the dynamics of the corporate culture today. Each character is well etched and you may even manage to catch a fleeting glimpse of yourself in it. You know there are a series of killings involved. You know it is about to happen and yet you wonder how? And more importantly who, even though you pretty much can put a finger on the culprit, not. On the flip side, at times, he dropped the pace with such a loud thud, that it took all the courage not to skip the page. But then again even Jeffery Archer could not stop me from turning away from mundane information, so I guess will leave it at that. A few instances, the spoon feeding towards conclusion could have been avoided. The shooting crew, the photo stream, the Vienna room pipes, the free Wi-fi, though all integral to the plot could have been sharper. Didn’t really fancy the banter between Karan and Kavya, something was missing. None the less, these minor glitches don’t steal the thunder of the book. A simple incident of the trustworthy customer makes you wonder if your bank has been honest with you. What happened in Iraq? This still haunts me! Page 221 : Were you able to get the details of all…………. 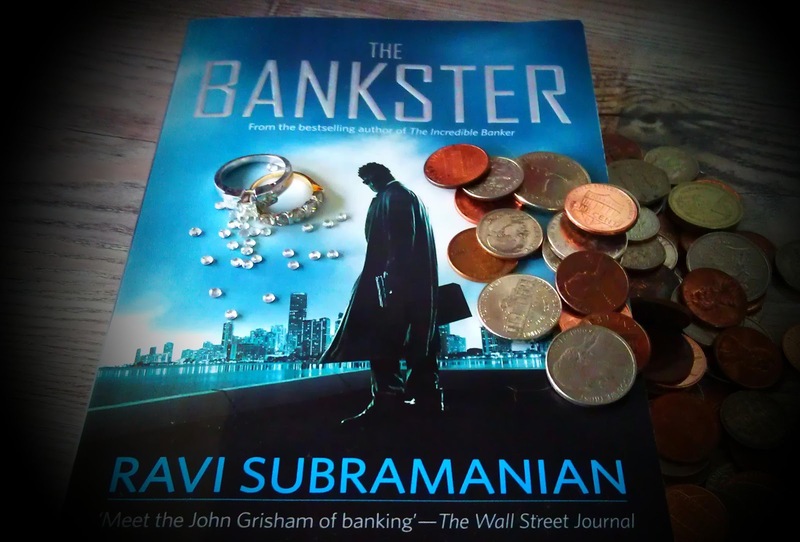 Page 289 : We will have to bring in the cops tomorrow…..
Having had a fleeting association with both the diamond industry and banking, I could co- relate so much with the story line. I read the book of 358 pages in less than 12 hours. If you have read my statutory warning, this should tell you volumes about how much I enjoyed it. The Bankster is clearly one of the good books I’ve read from an Indian author in recent times. Nothing quite prepares you for the climax, though that is how the author intended it, but of course. I won’t be surprised if this gets into a bound script sometime soon. It has all the potential to be a racy potboiler. But then who do you think would suit the role of the protagonist? Pick your copy before you answer that one. Looks these days are known to shape shift. This review is a part of the Book Reviews Program at BlogAdda.com. Participate now to get free books! Have you taken the #BrunchBookChallenge yet? Lagta hai film dekhne se pehle book padhni hi padegi. By the way, do you also do “Chapter” reviews? Batao, batao? oh i just missed volunteering for the review of this one ! but glad u liked it,do u have its pdf copy ? Diwakar, I am sure you should soon. Look forward to what you have to say. I liked the review and this one surly looks to be pretty descent book ..
Bikram…I think you should. I know I have and I’m loving it. Nirvana I hate those kinds that give away the story. It’s not fair. I am glad you noticed that bit. Corinne, I’d be surprised if they did not…..after all truth is stranger than fiction…. That was a review to reckon with! Detailed but not one that requires a spoiler alert – perfect.